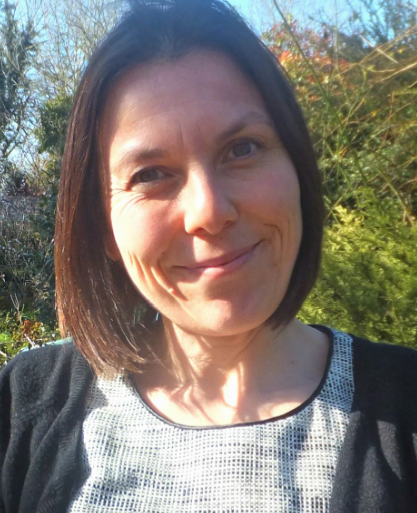 So I’m one of the many who have failed to finish a MOOC [completion rates have been given as low as 10% – see this Time article with links to stats, Katy Jordan gives a completion rate figure of 13% – 40%, there are also more reports on the OER Research Hub website. The MOOC in question was Stanford’s Open Knowledge MOOC – and I did write a few posts about the topics. Students completing, or not completing a MOOC, continues to be a hot topic in the Open Education world. For those of you interested in the discussions then I can recommend Martin Weller’s post ‘MOOC completion rates DO matter‘ as a good starting point. For me the problem has been an ending project with deadlines set in stone, a holiday and a need to spend every other non-working moment doing family chores. I also think motivation, or lack of it, played a part. Participating in a MOOC felt a little like a busman’s holiday and maybe I should have been learning about something different from that which makes up my daily workload. Anyway I just felt I should come clean. Maybe there will be more time for me and MOOCs in many moons! Week 4 was a cliptastic week on the Stanford Open Knowledge MOOC with a plethora of remixed videos arguing for and against current digital copyright laws and other legal and economic issues of openness. The Copyright clearance video explained it well: “copyright is complicated” – even more so when you start working across country and sector boundaries. Rights like fair use (where use is based on best practices and takes in to account the purpose and character of the use, e.g. commercial nature or is for nonprofit educational purposes; the nature of the copyrighted work; the amount and substantiality of the portion used in relation to the copyrighted work as a whole; and the effect of the use upon the potential market for or value of the copyrighted work) help the situation, but as most of us knew before embarking on this MOOC copyright is out-dated for the digital age. In the UK our equivalent fair dealing is limited to research and private study (both must be non-commercial), criticism, review, and news reporting. Interested in looking at something beyond the arguments around licensing I decided to put my energy into watching law professor Yochai Benkler on Open-source economics looks more deeply at the economics driving the democratization of cultural production. His argument is that years ago producers had to be able to raise financial capital to start producing news content. There was an industrial knowledge economy but it was market based or government owned. This requirement has been inverted by the Internet. There is now a distributed knowledge economy, capital is still required but it is spread out, resulting in communication and computation sitting in the hands of population. The issues are no longer just quality but relevance. We now have four transactional frameworks: market-based or non-market based, decentralised or centralised. There is more competition but also new opportunities – toolmakers for new systems, building platforms etc. Social production is a fact, not a fad, in some contexts it is more efficient than markets or firm, but it is a threat to and threatened by incumbent industrial models. Where can NGOs, foundations and individual open advocates have the most impact? What are the things we must do and/or are best positioned to do? What opportunities are out there for us that we’re missing? What role does open policy have to play? What metrics should we track? If we could only pick a few metrics to guide us, what would they be? What would show we’re collectively having impact? Great questions and I hope to share them with the Working Group sometime soon. Yikes! Week 3 of Stanford’s Open Knowledge MOOC already! Last week the topic was ‘Technological Change, Digital Identity, and Connected Learning’ and I watched Socialnomics by Erik Qualman (picked because it was the shortest video!) which filled me to the brim with interesting (and sometimes unbelievable) statistics. This week it’s ‘Participatory Culture, Citizen Journalism, Citizen Science’. The idea is get critical perspectives on openness as well as the positive ones. Now this I liked! I’m always really keen to try and get an opposing view to my own. Many of us live and work in a little bubble where we surround ourselves with agreement. The RSA Animate – The Internet in Society: Empowering or Censoring Citizens? Talk by Evgeny Morozov was really interesting. Hmm, which am I? Something to chew on while using my 0.07 attention span. Back in 2012 I took part in an Introduction to Openess in Education MOOC. I participated for a number of reasons. Firstly I wanted to experience a MOOC first hand, at the time they were a relatively new phenomena and I was curious. Secondly I was interested in the topic area, my knowledge in certain areas (for example around open data) was patchy. My final reason was to give myself something to talk about on this blog, I was struggling to find things to write about and needed a focus. So I’m struggling again with blog content…and I need a little inspiration. Maybe it’s time for my second MOOC – an opportunity to see how things have moved on – compare and contrast. Today Stanford have launched a OpenEdX MOOC entitled Open Knowledge: Changing the Global Course of Learning, it’s a topic I know a fair amount about, I actually work for an organisation called Open Knowledge! So I’m interested to see if the MOOC will change how I feel about different areas of Open Knowledge and if their (the course creators) ideas radically differ from mine by the content they chose and the questions they ask. I’m also interested to see what there is still to be learnt (lots I’m sure) and to catch up new with people. The MOOC is research in itself. The Stanford team are carrying out research study on learners’ perceptions of open knowledge within the MOOC and one of the first activities is a survey. It will be interesting to hear their findings later on. The Open Knowledge MOOC was developed by a team of instructors from Canada, the US, Ghana, and Mexico. They have attempted to make the MOOC as bilingual as possible with significant content in Spanish. The interface language can be changed, videos are transcribed and subtitled, content is flexible – none is mandatory – so missing content not available in your language is an option. After browsing through the first module it looks like all the videos are available on YouTube and the recommended reading are all available online. It would be good to have the licence of content clearly marked though – I added this as a comment. The Connecting track, for those looking to spend less time on the course. The Evaluating track needs a little more time to complete, and involves not only completing the Connecting requirements, but also doing some further writing. For the most ambitious students there is the Creating track. This will take the most time, as you will need to complete both the Connecting and Evaluating requirements, as well as build a digital project. Write 4 discussion forum posts over the course of the semester. These posts should focus on topics from the weekly course content. Constructively comment on 4 peer discussion posts throughout the semester. Write 8 tweets throughout the semester. These tweets should focus on topics from the weekly course content – can’t find the hashtag for it at the moment! Share 8 newly discovered resources in the course Diigo group. Write a self-assessment documenting my completion of the track requirements and describing your learning experiences. Once I’ve got in to the MOOC I’ll publish an update to let you know how it’s going! Yay! 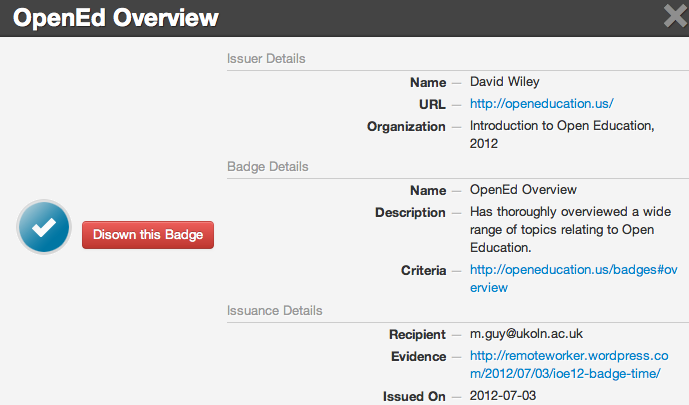 Almost 3 months completing my Introduction to Openess in Education MOOC I have now received my badge!! 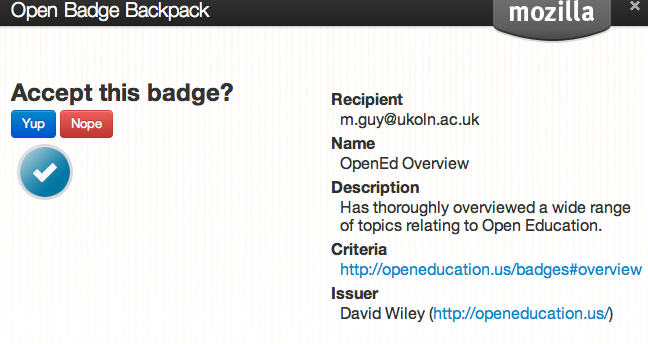 David Wiley sent me a link to the IOE12 badges earned page where I am now listed as having completed my OpenEd Overview badge. To claim my badge I had to log in to the Mozilla Open Badge Backpack through Mozilla Persona (Mozilla’s ‘identity system for the Web’). I then clicked on my claim badges link – but unfortunately there was an error. Luckily David Wiley managed to fix it fairly quickly (apparently he just re-confirmed the cryptography!?). After that it was just a simple case of adding the badge to my open badge back pack. The badge could then be added to a group and opened up for the public to see. I’m still not entirely sure how I add the badge to a page, I’m guessing they’ll be a widget for WordPress…but that’s something for another day. For now I’m just very proud to have my badge! The Open University have recently released a report on Innovating Pedagogy exploring “new forms of teaching, learning and assessment for an interactive world“. The report quite rightly contains sections on MOOCs and Badges to accredit learning. Badges are seen as having potentially high impact in the next 2-5 year. Badges have great potential – I touched on this in my Badge On: Open Assessment post. There hasn’t been a lot of interaction taking place during the MOOC, something I was surprised by, but I have had some contact with fellow student Jeroen Breman (@jeroen69). He was awarded a badge earlier on in the year and so I sent him a tweet to ask how he’d managed it. Jeroen had been emailing David Wiley too. His response tweets have left me unsure of what to do. I’ve emailed David Wiley and posted and tagged my intention to be awarded a badge – where do I go from here? The course content was, on the whole, interesting; though it was very US and Wiley focussed. It would have benefitted from more video content (but possibly shorter videos – nobody has the time to watch 2 hour videos, though they could manage 10 minutes – occasionally participants were instructed to “watch the first 20 minutes”). Maybe the course could also have offered a more rounded view by suggesting links to resources that give an opposing opinion. There also was no introduction to each of the resources, no ‘map’ of how they fit together and no questions to consider. Following up on all the suggested links was very time consuming. Some of the recommended reading was 50+ page documents and it was difficult to justify the time to read them. The whole coures took a lot longer to plough through than I initially thought it would. A little more guidance wouldn’t have gone amiss. Not receiving my badge hasn’t helped. I would really have liked to have practical experience of receiving a badge and embedding it in a site. As Jeroen says, you lose your motivation to carry on. Authenticating students in a manner to satisfy accrediting institutions or hiring companies that the student identify is actually known. I’d have to agree that points 2 & 3 have been real issues for me. OK – so it now seems to be my problem…but actually I’m fairly tech savvy, I work in a remote environment, I am familiar with online learning, I was motivated to do the course…. So if I feel a little short-changed then god knows what everyone else must be feeling. It seems to me that open education is a move in the right direction, but it still has a lot to work out. Traditional models of learning don’t always work, but they are tried and tested and people know what they are getting. With open education there are times when you might not be getting what you expected, but then an argument could be made that you are still getting a free and open education. However education requires effort by both the learner and the ‘teacher/facilitator’ so it’s never totally free! People don’t want to put the effort in and then find they haven’t learnt what they’d hoped to learn and have nothing to show for it. It’s like children at the dentists, the odd few don’t care but the majority feel a lot happier after they get their well done sticker. It helps motivate them to come back next time. In January this year I spotted a tweet by a colleague who had decided to try out the Introduction to Openness in Education (#ioe12) MOOC (Massively Open Online Course). The course content sounded interesting and it provided me with a free and easy way to try online learning, so I decided to give it a go. To get the OpenEd Overview course badge I need to link to all my posts (which I’ve done) and announce my intent to have completed the badge. Which I’m doing now! I’ve also emailed David Wiley – just to be double sure! Once I get my badge I’ll finish with a summing up post telling you about all the things I’ve learned.